One of our agency’s core values is transparency, and there are many ways that we try to live out that value in our work. We think it’s important to share publicly our goals and how we are making progress on them, and to that end, we have launched an agency performance dashboard on our website. 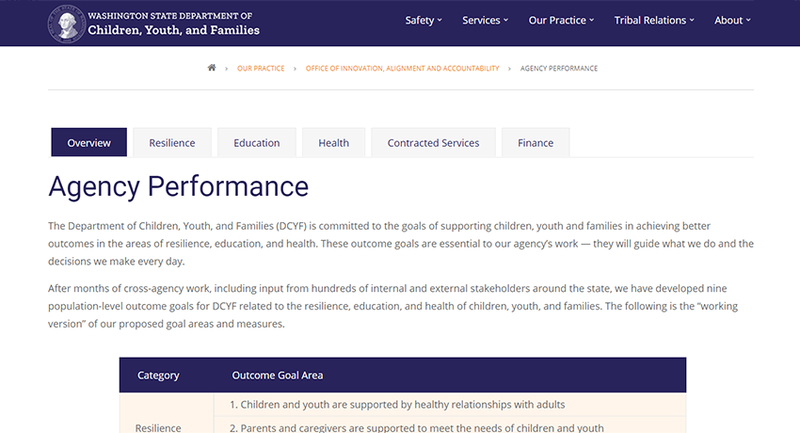 We are committed to improving outcomes for children, youth, and families in the broad areas of resilience, health, and education, and are reporting data collected not only by DCYF, but also other agencies that serve children, youth and families. The content for the dashboard was produced by our Office of Innovation, Alignment, and Accountability, which houses our agency’s data, reporting, research, and analysis teams. You’ll notice, though, that some of the data comes from our future colleagues in Juvenile Rehabilitation, as well as our partners in the Office of Superintendent of Public Instruction, the Department of Health, the Research and Data Analysis division of the Department of Social and Health Services, the Education, Research and Data Center (ERDC), and others. We are grateful for their continued partnership as we work together to serve children, youth and families in our state. We hope you find the dashboard useful, and we look forward to improving it over time as our agency’s strategies evolve and our capacity for reporting grows. If you have questions or feedback about the dashboard, email us at OIAA@dcyf.wa.gov.